MOJAVE, CALIF., Mojave Chamber of Commerce PR (Jan. 15, 2013) — Mojave Air and Space Port CEO Stuart Witt has been selected to receive the 2013 Antelope Valley Board of Trade Navigating Change Award for his efforts in attracting and retaining business at the nation’s first commercial spaceport during the recent economic recession. While the nation and the world suffered job losses and economic devastation, two of the largest buildings constructed in the Antelope Valley and Kern County were being built and hundreds of new engineering and technical jobs were created in the emerging commercial space industry based at the air and spaceport. As a new generation of Mojave-based spacecraft and unmanned air vehicles were being tested in the skies over the Antelope Valley, components for the state’s largest wind energy installation were being unloaded on the airport for transfer to construction sites due to the actions of Witt, his staff, and members of the airport/spaceport’s elected board of directors. All of this is being done during a recession at a place with no “redevelopment agencies” or “enterprise zones,” and in a state with a reputation for not being a good place to do business. Currently, some 1,100 people are employed by established tenant firms on the airport, with another 550 to 1,000 who come to work each day in construction, for the railroad, or in temporary employment. In addition to hosting a booming aerospace industry, the airport/spaceport is a busy industrial park supporting Progress Rail’s railroad wheel maintenance operation, a UPS distribution center, a vehicle maintenance business, and other job-creating enterprises. Railroad tracks installed during World War II are used by Progress Rail and by Union Pacific Distribution Services to transload huge components for delivery to Mojave’s booming renewable energy industry and for other rail-borne cargo. All of this has been done in a county whose planning director and county supervisors, both East Kern residents, and other local government agencies believe in helping rather than hindering business growth, and with runways, taxiways, and other infrastructure built and expanded with money obtained by Members of Congress representing the region including Bill Thomas and Kevin McCarthy. Over the years, airport district officials have developed numerous projects for improving the airport, and have projects “shovel-ready” when government grants become available. This activity has attracted international attention to Mojave, Kern County, and the Aerospace Valley, in magazines, electronic media, and online; efforts that help every business and resident of the East Kern and Antelope Valley region. For example, a recent pilots’ convention held in conjunction with the Mojave Transportation Museum Foundation’s monthly Plane Crazy Saturday events at the airport filled two Mojave motels with guests and brought business to other local firms. 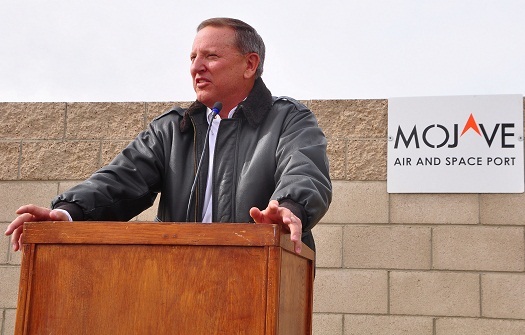 What has and continues to happen at the Mojave Air and Space Port has been a collaborative effort, a prime example of what can occur when innovative pioneers at all levels of society work together for the common good. Witt was nominated for the award by the directors of the Mojave Chamber of Commerce.